The SC115 CS I/O-to-USB Flash Memory Drive is an innovative 2-GB device that allows you to augment your onsite data storage or to transport data between the datalogger and PC. 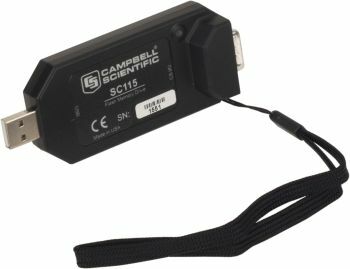 The SC115 can be used with most of our CRBasic dataloggers, and is the only storage device compatible with our CR800 and CR850. This lightweight, portable device directly connects to either the datalogger’s CS I/O port or a PC’s USB port (no cables or interfaces required).